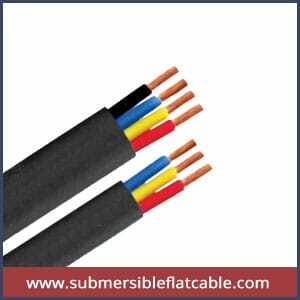 We are occupied in manufacturing and supplying quality assured Three Core Submersible Flat Cable. Our offered cable is essentially used for winding of submersible pump motors. The offered Three Core Submersible Flat Cable available in the tube well being narrow the shape of the cables has to be appropriate for such an application. This cable is manufactured at our high-end production unit by utilizing greater quality raw materials with the support of existing technology as per predefined industry norms. Our clients can simply acquire this cable at pocket-friendly price. The range we have made for our clients is available in different specifications as per the clients’ diverse needs. The superior construction of these cables provides them protection against rain water as well as from ingress of small solid foreign bodies. These cables are produced from quality electrolytic copper and come with conductors that are insulated with special grade PVC and outer sheath comprising abrasion resistant PVC compounds.